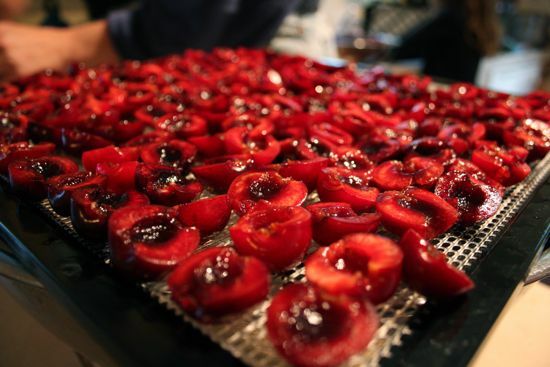 A few years back, I put some Bing cherries in our dehydrator - you know, for science - and I've been drying cherries ever since. Uber-yumminess! They make great snacks, easy to grab on the way through the kitchen. I put them in granola and gorp, too. 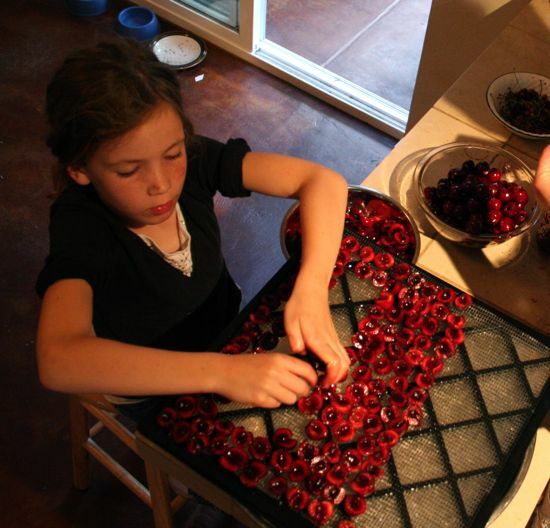 This is the first year that Caitlyn has gotten involved in the madness that is prepping 20 pounds of cherries for the dehydrator. That may have a lot to do with this being the first year that the box of cherries arrived at the house before dinner-time. Using the cherry pitter, naturally, was the thing she was most excited about, but the appeal wore off once it became clear that pitting cherries requires a certain amount of precision. You can't just bang away on the pitter. 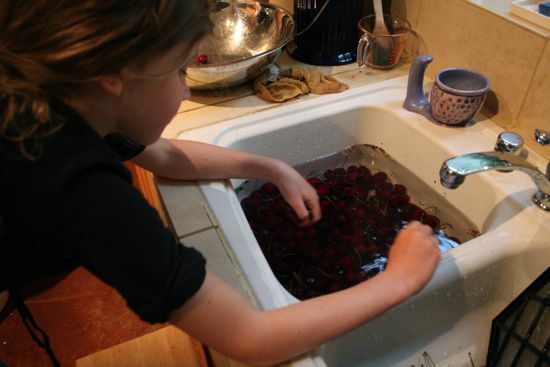 She did a great job of loading the dryer trays with halved cherries, though, and loading the trays into the dryer. Of course, everyone's hands turn purple. 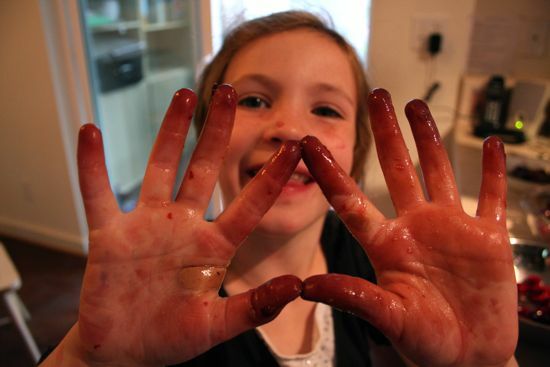 Cherry juice stains your fingernails for days. 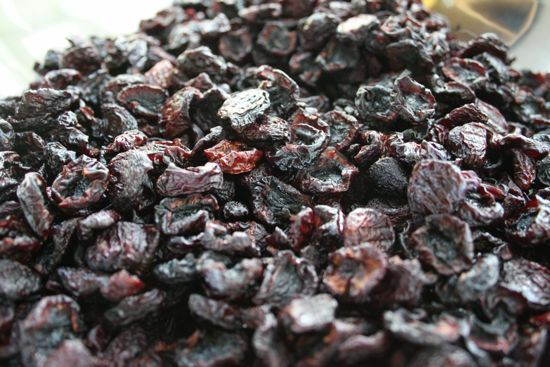 Two days later, we have this: a bowl full of dried cherries! This batch worked out to being something like 14 half-pints. Edible happiness! 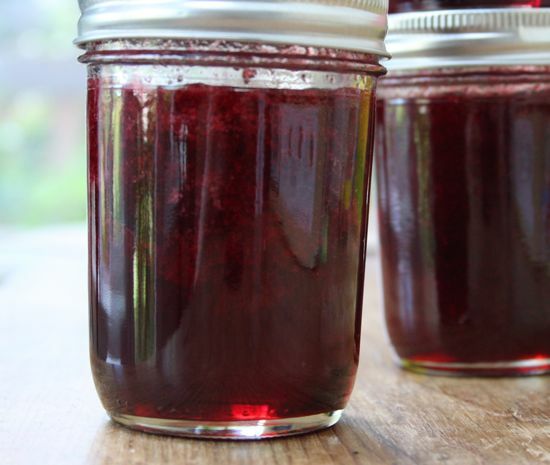 Oh, and a batch of Bing jam. Just because. The process of putting summer in a jar has begun! What to do with even more cherries?